Flambé (/ [unsupported input] flɒmbeɪ /, French: [flɑbe]; also spelled flambe), is a cooking procedure by igniting a fire in a dish containing or given alcohol. This word means "burning" in French. 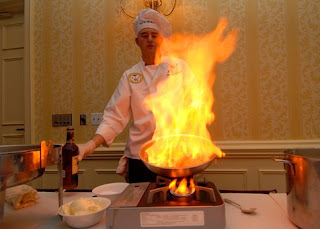 The flambé technique is often used for table-side presentations of several dishes, such as Bananas Foster or Cherries Jubilee. This technique is also an important step in making coq au vin before being brought to the customer's table. 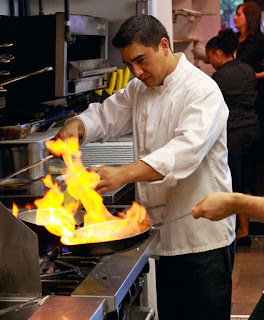 Flambé can add the aroma and taste of a food.